We've gotten a lot of use out of this, and I think we will for a while longer. When BabyCakes first came home she would sleep in the napper portion in our room. 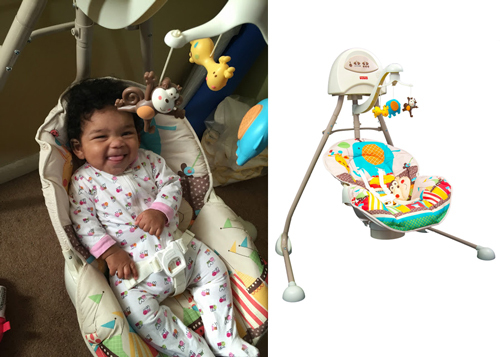 When she transitioned to sleeping in her room in her crib at night, we moved it to the living room and put her in it for naps. Once I went back to work I brought it with me to my office so she would have somewhere to play. When she got more mobile (I caught her planking on the side of it lol) I dropped the mattress down to turn it into a playpen, and now that is how she plays in it. 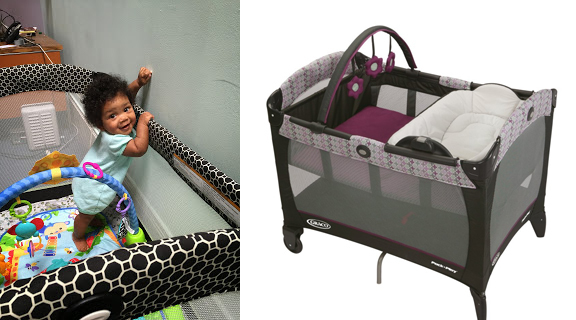 This is also really good for travel to have something easy to setup for baby to sleep or play in while away. 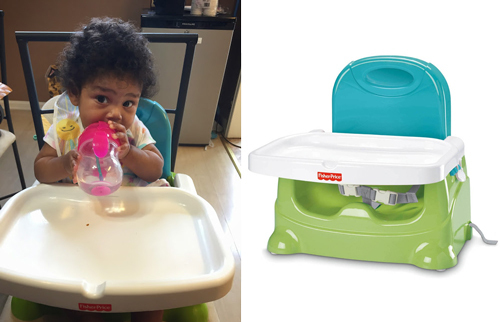 This is the chair we have for BabyCakes to eat from. You can hook it onto any chair, so we co-opted one of our dining room set chairs for it. It's a simple little seat. Everything is plastic so it wipes down easily. She's very comfortable in it. I got this $120 swing from Ross for only $70. I was SOOO excited when I found it. It was the only one, and I was 7 months pregnant, but I carried that sucker by myself out to a cab cause I could not pass up the deal. Plus, it was jungle themed like her room. This was a great buy. This was a lifesaver. In those early day when the only way I could get her to take a nap in a place that wasn't on my chest was in this swing. "Swing nap" was a coveted thing for us. That's when I would eat with both hands, and take a comfortable nap myself. It rotates so it can swing both side to side and front to back. I was sad when she got too heavy/mobile for this swing, but it's made it's way to a new home. 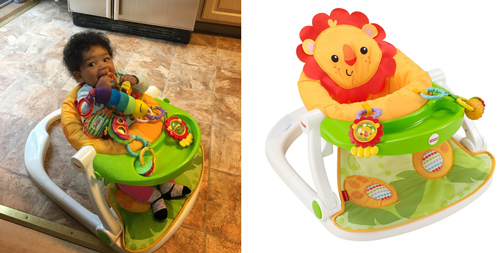 There came a point where BabyCakes wanted to be sitting up when she was lounging, rather than reclined like in the swing, but she couldn't sit up on her own yet, so we got this chair. It actually came the day all three of us were battling a stomach bug. She loved it, thank God, because it gave me somewhere secure to put her while I laid around praying for us all to get better. She rarely eats in this, but it does have a snack tray. 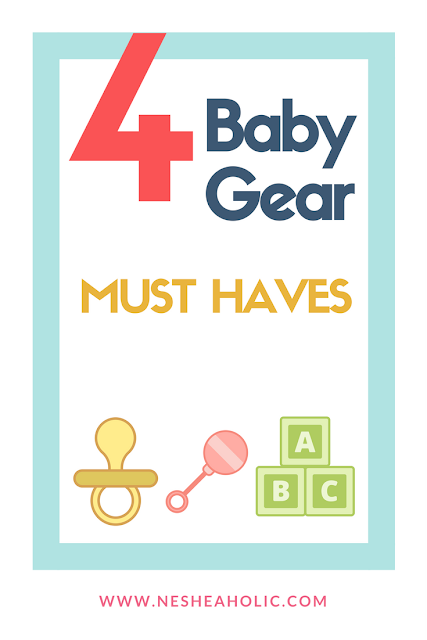 What Baby Gear is on your MUST HAVE list? I'm definitely getting a booster seat next time! Might be better than the high chair I think! It's working out really well! I like that I can wipe everything down easily. These are all definitely must haves! Especially the booster seat. I love mine.